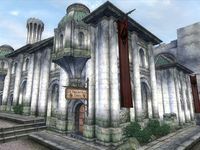 The King and Queen Tavern is a middle-class tavern located in the Imperial City's Elven Gardens District. It is found across the street from Jastia Sintav's House and Luther Broad's Boarding House and next to Iniel Sintav's House. The room you can rent is the one at the end of the corridor; it consists of a single bed, cupboards, chests of drawers and a working table. The other room has the same arrangement but is rented by Velwyn Benirus, and therefore you cannot sleep in the double bed. The Thieves Guild Fence Fathis Ules can be found eating and conducting his business here every day at lunch. Both during and after the Where Spirits Have Lease quest, you will find Velwyn Benirus here. Esta página foi modificada pela última vez à(s) 14h55min de 1 de outubro de 2014.